Pages in category "Crown jewels"
The Imperial Regalia of Japan, known as the Three Sacred Treasures of Japan, consist of the sword Kusanagi, the mirror Yata no Kagami, and the jewel Yasakani no Magatama. The regalia represent the three virtues, valor and benevolence. Since 690, the presentation of items to the Emperor by the priests at the shrine has been a central element of the enthronement ceremony. This ceremony is not public, and these items are by tradition seen only by the Emperor, because of this, no known photographs or drawings exist. Two of the three treasures were last seen during the accession and enthronement of Emperor Akihito in 1989 and 1993 and these treasures were eventually said to be passed down to Emperor Jimmu, who was the first Emperor of Japan and was Ninigis great-grandson. Traditionally, they were a symbol of the divinity as a descendant of Amaterasu. Susanoo presented the sword Kusanagi to Amaterasu as a token of apology, he had obtained it from the body of an eight-headed serpent, Yamata no Orochi. In comparison to many European monarchies regalia, the Dutch Regalia are relatively new, having been commissioned by King William II in 1840. An earlier, more modest set of made of silver was commissioned by King William I in 1815. It symbolises the dignity of the Sovereign as head of state, the crown was manufactured by the Amsterdam goldsmith Bonebakker. 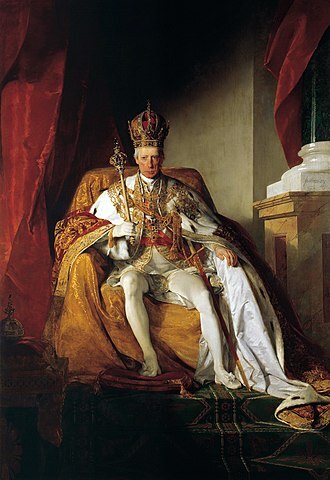 It is made of gilded silver, adourned with coloured stones, the sceptre, symbolising the reigning King or Queen’s authority, the orb, symbolising the Sovereign territory, Both sceptre and orb were made by court jeweler Meijer from The Hague. The arms of the Netherlands have changed since 1815, but the depiction on the gonfalon has not, the artwork was by Batholomeüs Johannes van Hove. All these objects, including the mantle are only used at the enthronement of a King or Queen and have been given by Queen Juliana to the Foundation Regalia of the House Orange Nassau. The mantle is made of velvet and is trimmed with ermine. 83 lions, embroidered in gold, adorn the mantle, the mantle was first used in 1815 and has been redesigned several times to fit the various monarchs and reflect the changing fashions. The lions are old and were part of King William Ist mantle, Dutch monarchs have never been physically crowned. During royal inaugurations, the crown and orb are displayed on a table in the Nieuwe Kerk in Amsterdam, where the inaugurations take place. The Gonfalon of State and Sword of State are carried in the procession from Dam Palace to the Church and are held on either side of the royal dais in the Church during the swearing in ceremony. Sometimes the regalia are dubbed crown jewels, in the past, the terms House-diamonds, House-jewels and family jewels have been used. In 1790 the term Bijoux de la Couronne was used by Luise of Brunswick -Wolfenbüttel to refer to a diamond from Borneo. In 1896 the Firm of van Kempen & Begeer wrote about resetting the jewels of the Crown, Queen Juliana gave a selection of her formal jewelry to the new Foundation Regalia of the House of Orange-Nassau, instituted on 27 July 1963. In 1968 a Foundation Kroongoederen van het Huis van Oranje-Nassau was instituted and it owns the regalia and the House-jewels. They were originally held in Prague and Karlštejn Castle, designed in the 14th century by Matthias of Arras. Since 1791 they have stored in St. Vitus Cathedral at Prague Castle. Reproductions of the jewels are permanently exhibited in the exposition at the former royal palace in the castle. The crown was made for the coronation of Charles IV in 1347, the crown has an unusual design, with vertical fleurs-de-lis standing at the front and sides. Made from 22-carat gold and a set of precious 19 sapphires,30 emeralds,44 spinels,20 pearls,1 ruby,1 rubellite and 1 aquamarine, at the top of the crown is the cross, which reportedly stores a thorn from Christs crown of thorns. The Royal sceptre is made from 18-carat gold,4 sapphires,5 spinels and 62 pearls with an extra large spinel mounted on top of the sceptre, the Royal orb is made from 18-carat gold,8 sapphires,6 spinels and 31 pearls. It weighs 780g and is decorated with relief scenes from the Old Testament. The Coronation robe was used from 1653 until 1836 and it is made from precious silky red material called zlatohlav and is lined with ermine. The robe is stored separately from jewelry in an air conditioned repository. For the coronation ceremonies, St. Wenceslas sword, a typical Gothic weapon, was used, the iron blade length is 76 cm, at the widest point is 45 mm and has a ripped hole in a cross shape. The wooden handle is covered with fabric and velvet embroidered with the ornament of laurel twigs with thick silver thread. 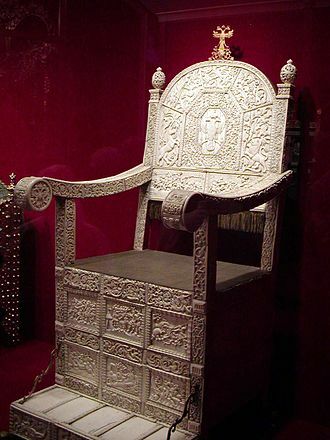 After coronation ceremonies, the sword was used for the purpose of granting knighthoods, the oldest leather case for the crown was made for Charles IV in 1347. On top are inscribed four symbols, the Imperial eagle, Bohemian lion, the door to Crown Jewels chamber, and likewise the iron safe, is hardly accessible and has seven locks. Vitus Cathedral and the Mayor of Prague, who must all convene to facilitate opening the impenetrable door, the crown is named and dedicated after the Duke St. Wenceslaus of the Přemyslids dynasty of Bohemia. The jewels should be stored in the chapel of St. Wenceslaus in St. Vitus. 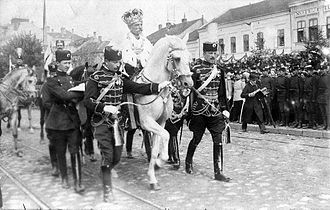 They were only lent to Kings, and only on the day of the coronation, after 1918 and the establishment of the Czechoslovak Republic the Coronation Jewels ceased to serve their original function, but remained important as symbols of national independence and statehood. The Georgian Crown Jewels were the regalia and vestments worn by the monarchs of Georgia during the coronation ceremony and at other state functions. Of these royal jewels—a crown and scepter—only the latter staff survives, but none of these specimens has come down to us. These were a crown and other symbols of investiture commissioned by the tsarina Catherine II from Louis David Duval and these items were carried away by the Iranian ruler Agha Muhammad Khan on his sack of Heraclius capital of Tiflis in 1795 and have since been lost. Only pictorial depictions survive, such as on the reverse of a medal, commemorative of the Treaty of Georgievsk, on 20 February 1801, the Russian military escorted the royal regalia from Tiflis to St. Petersburg. In 1811, Alexander I had these items deposited as part of the Russian sovereigns regalia in the Kremlins Armoury, the Georgian Crown was made of gold, a circlet surmounted by ornaments and closed by eight half-arches on which rested a globe surmounted by a cross. The Ducal hat of Liechtenstein is a former crown of the Princes of Liechtenstein, who were Dukes of Troppau and Jägerndorf. It went missing in the 18th century, the ducal hat of Liechtenstein was commissioned in 1623 by Prince Karl I of Liechtenstein and completed in 1626. It was discovered to be missing in 1781, following the death of Prince Franz Joseph I, in 1976, the people of Liechtenstein presented a replica of the crown to Prince Franz Josef II on his 70th birthday. The replica is based on the drawing of the crown, dated 1756. The circlet of the crown was modeled on the circlet of the Imperial Crown of Austria, while eight jeweled acanthus leaves, alternately large and small, rested on the rim of the circlet. As with the crown of Rudolf II, the precious stones used in this crown were white and red. 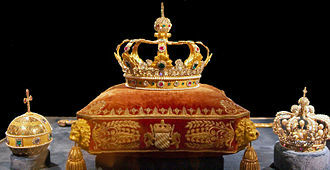 Inside the crown was a red velvet cap topped with a large jeweled button, the only depiction of the original crown dates from 1756, a gouache painting that is kept in the Liechtenstein Museum. King David IV's imperial crown with pendilia. A fresco from Gelati. A 1790 commemorative medal depicting Heraclius II's regalia. The Georgian Crown, the lost jewel of King George XII. A 19th-century painting by Fedor Solntsev from the Moscow Kremlin Museum. The Irish Crown Jewels. This image was published by the Royal Irish Constabulary and the Dublin Metropolitan Police twice a week after the theft of the jewels was discovered. The Holy Crown of Hungary having pendilia. 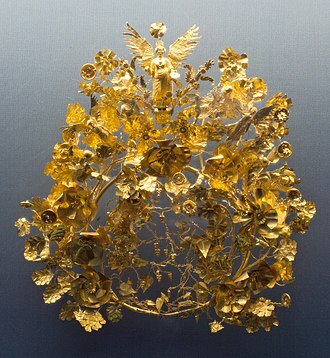 Votive crown of the Visigoth King Recceswinth († 672), part of the Treasure of Guarrazar. Made of gold and precious stones in the 2nd half of the 7th century. National Archaeological Museum of Spain (Madrid). Ducal hat of the Duchy of Styria is exhibited in the Museum im Palais in Graz.